For years I have heard things about 'Love and Logic,' but today Don and I had the opportunity to go to a one day seminar in Shoreline instead of our usual teaching duties. It was presented by Charles Fay, the son of the founder of L+L. He was very entertaining and easy to listen to. The principles that were presented were very simple and practical. 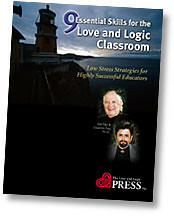 Love and Logic is an approach to discipline which helps kids own and solve their own problems. Some of my favorite 'sound bites' were "Plug the holes before you launch the boat" and "The more I worry about another person's life the less he has to." He did wet my appetite to read the book for teachers. Their material looks like a great resource for parents as well.